I am thrilled to be partnering with Fresh Thyme to bring you this insane Vegetarian Green Curry. I am beyond obsessed with everything Fresh Thyme is about – and as always, all opinions are my own. Thank you for supporting Hungry by Nature and the brands that make it possible! 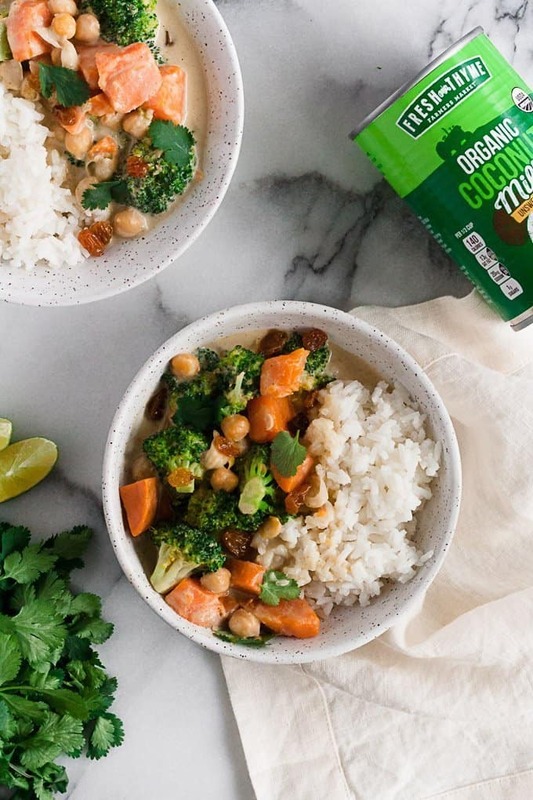 I don’t know how this happened; but this 10 ingredient vegetarian green curry is the second plant-based meal I’ve shared this month… WHO AM I?! As a self-proclaimed meat eater and lover, I am really been trying to cut back on the amount of meat I consume and focus more on plant-based meals. I first talked about this when I shared my charred sweet potato and brussels sprout tacos as a part of this month’s post-Whole30 theme of food freedom. As someone who follows a primarily paleo diet, meat has always been my source of protein; and I know that I feel best when I eat animal protein. But after completing my January Whole30 and exploring food reintroductions and food freedom, I have found that legumes – including the chickpeas in this recipe – serve as a great source of plant-based protein. 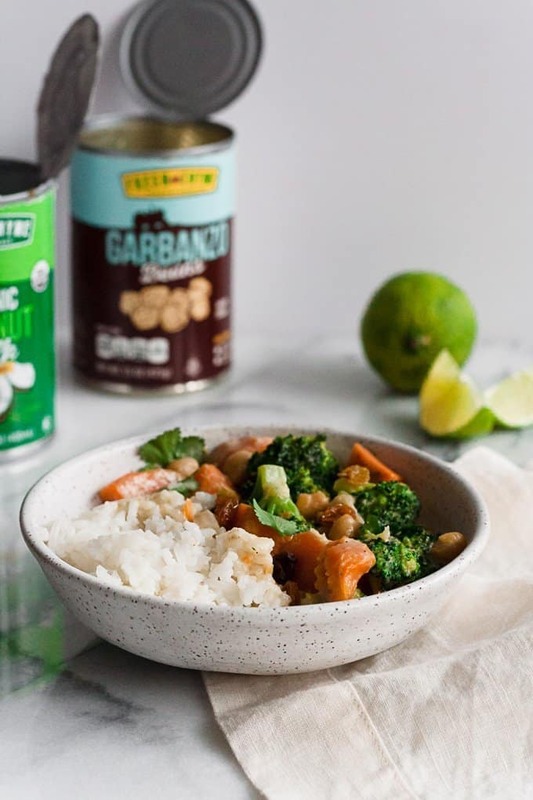 This 10 ingredient vegetarian green curry is loaded with good for you ingredients that I picked up at my favorite grocery store – Fresh Thyme Farmers Markets! Like all Thai curry recipes, the base of this curry is green curry paste. I love the Thai Kitchen brand which you can easily find at your local store! But what really makes this recipe is Fresh Thyme’s Organic Coconut Milk. 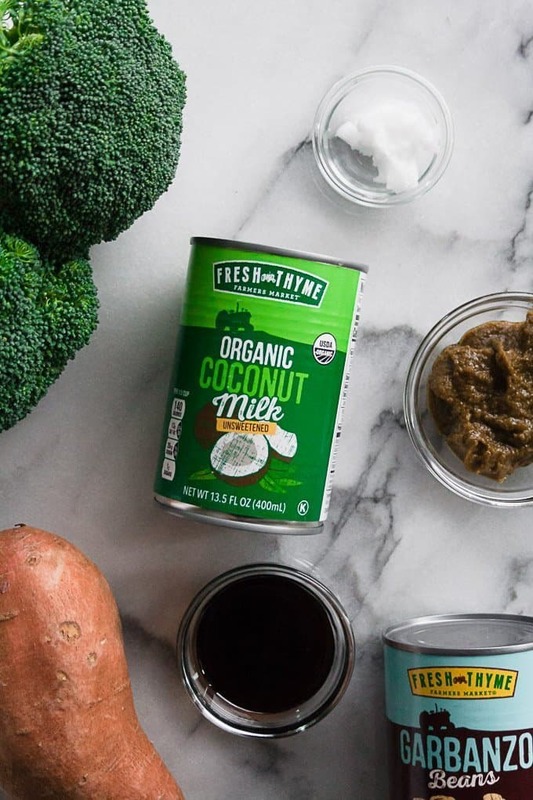 Coconut milk is the stuff of gods (dramatic, I know, but it’s true!) – it is thick and creamy thanks to the high fat content and makes the curry extra cozy. I recommend you get the full-fat coconut milk; it will make the curry extra flavorful and super creamy. And you obviously cannot forget your veggies! Fresh Thyme has everything you could ever want and more in the veggie department, but I decided to stick with my trusty staples – sweet potato and broccoli. I adore sweet potato in this recipe for the pop of orange and some complex carbs. And broccoli is my #1 vegetable for curry – I always love adding in extra greens when I can! 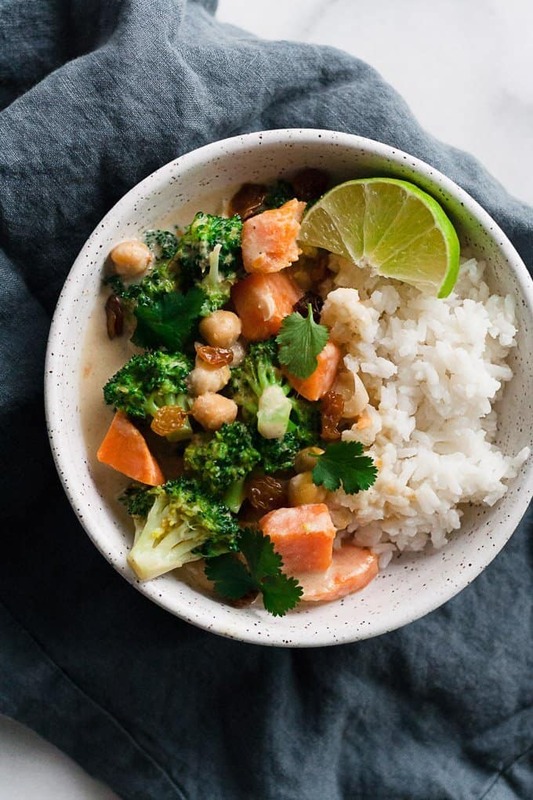 If you have reintroduced grains into your diet with no issue, serving this 10 ingredient vegetarian green curry over white rice is hands-down the best. The rice soaks up the broth and creates the perfect bite; and if not, this would be great over cauliflower rice too. But no matter what you serve the curry over, I highly recommend topping it with a few golden raisins, fresh cilantro, and a big squeeze of lime juice. I know the golden raisins might seem weird, but trust me – they really take this recipe over the top! 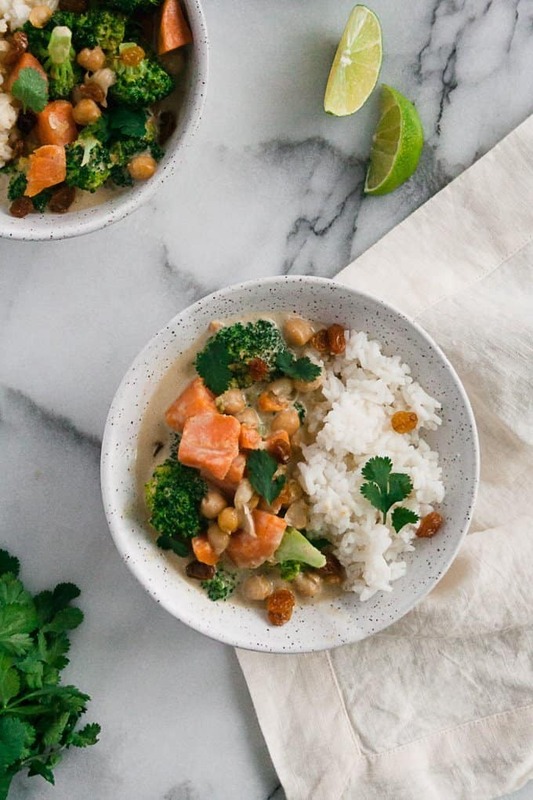 If you are a meat eater and lover like me, I hope you give this 10 ingredient vegetarian green curry a try, whether you are reintroducing foods post-Whole30 or exploring your food freedom! If you make this recipe, remember to tag @imhungrybynature on Instagram! Heat the oil in a 4-quart (or larger) Dutch oven or heavy pot set over medium-high heat until shimmering. Add the curry paste and fry for 2 minutes, stirring frequently. Be cautious, as it will sputter. Add chickpeas, sweet potatoes, and coconut milk to the dutch oven. Simmer for 5-10 minutes until potatoes are fork-tender. Add broccoli, fish sauce, coconut aminos, and coconut sugar. Simmer for 3-5 minutes until broccoli is bright green. Serve over white or cauliflower rice and top with your favorite curry extras! I like to add a lot of cilantro, a big squeeze of lime, and a few golden raisins to finish it off! Marvelous…this looks sooo good and more delicious..this is a perfect recipe for a vegetarian… i will trying to making…in few days latter…Thanks for sharing…. !